Burmese Million Dollar Star Ruby! 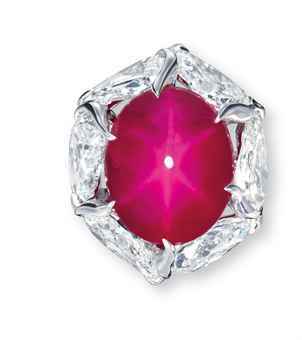 19.53 carats, Burmese Origin, Natural Ruby, Star Ruby, Gubelin certified what else does a woman want? Surrounded by 6 diamonds each accompanied by a GIA grading report. Oh, & the price realized was, USD 1.247 million only.